Paper training your dog - What exactly is it? Whenever you are paper training a dog you’re going to have to teach it: where to eliminate (pee or poop) and to only eliminate on newspapers that you gather up and throw away after use. Many new owners of dogs and puppies still opt to use this type of elimination training instead of teaching them to go outside in the first place. And that's entirely your choice. So you have the option of training your dog or puppy to "go" on paper in a spot of your choosing inside - or - you can train the dog or puppy to let you know when it needs to "go" so that you can take it outside to do it's business. But for the purpose of this little article we will further discuss the first method - teaching your dog or puppy to "go" on paper in a spot of your choosing inside your home, for you to have to clean up and dispose of later. 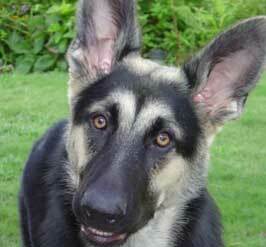 • Feed your German Shepherd puppy at specific, scheduled times. This encourages your dog to develop an “elimination timetable”. • Praise the puppy a lot whenever you see her eliminating on the paper. Wait until she’s done then praise her, pet her, and give her a treat. • If you catch the puppy in the act of eliminating off the papered area interrupt her with a clap or loud verbalization (“Ah-ah-aaaah!”) scoop her up immediately and put her on the papered area. When she finishes, praise her again. • If you come across an accident after the fact clean it up and supervise her more carefully. If this happens a lot, then you’ve given your dog too much freedom in the house and not enough supervision: step back, restrict her access to the unpapered floor, and provide more supervision. For further information on house training your dog, including a detailed look at the topic above as well as crate training, check out The Ultimate House Training Guide. It’s the complete dog house training guide and comes highly recommended. Interested? Click on the graphic below to learn more now.